The Eighth Route Army Culture Park in Wuxiang county, China, allows visitors to dress up at Chinese or Japanese troops. And then shoot each other with phony guns. As tensions between Japan and China reach a fever pitch, this US$80 million theme park, which is backed by the local Chinese government, looks to do more than simply cash in. The theme park opened a year ago, and is located in an area of China that's famous as a "red tourism" destination. During the 1930s and 40s, over 90,000 of its residents joined the Eighth Route Army, making up the majority of the 140,000 troops that would fight over 4,300 battles against the Japanese. The theme park features trench simulation scenarios based on the video game Stalker that allow visitors to don either Japanese or Eight Route Army outfits and shoot toy weapons. The Eighth Route Army was a unit of the National Revolutionary Army that fought against the Japanese. Besides dressing as them, visitors can also ride a train and shoot at Japanese soldiers. There are even live-action performances that show actors dressed as Japanese troops that stick samurai swords in plainclothes Eighth Route Army soldiers and then shoot them. This past August, the county held its first Eighth Route Army Cultural Festival, reports China Daily. Eighty retired soldiers, like 87 year-old Eighth Route Army vet Duan Yirong, were invited to attend. "Before I joined, many people in our country, including me, were beaten and killed by Japanese soldiers," Duan told China Daily. I lived a terrible life. "People died every day in our village. Picking up a gun and joining the army was the best way to protect our homeland and improve our lives." Photojournalist Jason Lee at Reuters took these photos, which first hit online late last month on sites like The Atlantic. Recently, the photos have been making their way onto Japanese websites like Zaeega. The reaction of Japanese commenters has been interesting and has ranged from "Oh, wow, this looks interesting" to "Man, China is totally uncool." 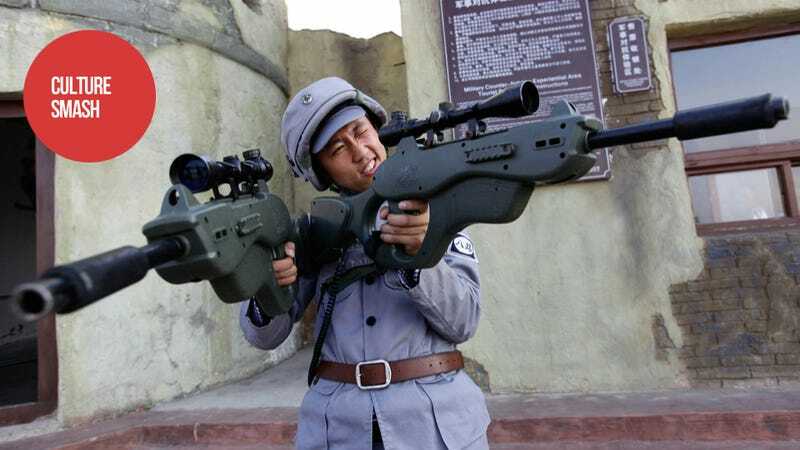 Those Japanese commenters who have dismissed the theme park are not only calling it propaganda, they're also wondering why the weaponry was not historically accurate and saying the theme park was disrespectful to both Japanese troops and Chinese ones. Army vet Duan, however, is supportive of the theme park, saying, "It brings alive the heroic history and nightmarish days we endured. It opens a frightening window on war but also conveys the meanings of loyalty and sacrifice."